I am travelling most of today to distant climes. And it is Wednesday, my alleged shorter blog day. 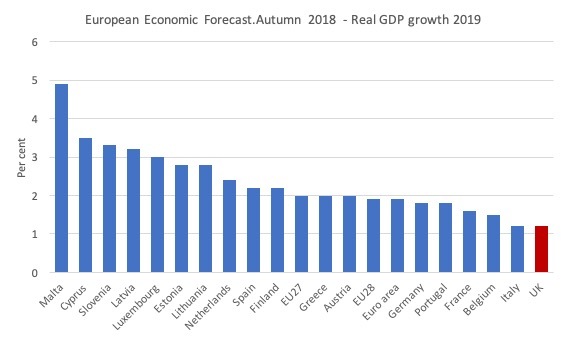 Apart from some scintillating music suggestions today, I foreshadowed in Monday’s blog post, which analysed the British national accounts, that I would make some statements about the EU forecasts released in their latest – European Economic Forecast. Autumn 2018 – (published November 8, 2018). The forecasts posited that the UK would be among the two worst performers for 2019 in terms of Real GDP growth, accompanied by the waning Italy. And within seconds of the forecasts being published, social media was a light with those opposed to Brexit, using the forecasts to claim that Brexit would be a disaster – again! Brexit may still turn out to be a disaster. But these forecasts should be treated with a grain of salt – they are ideological in nature and the forecasting performance of the EU has not been good. Here is the graph of the November 2018 forecasts for real GDP growth in 2019. It looks to be a sorry tale for Britain and Italy. Go back to this time last year, when the EU published their – European Economic Forecast. Autumn 2017 (published November 9, 2017) – which told us what they thought would happen this year. I have done some ‘data engineering’ to see what would be required in either the last quarter of 2018 (if the Member State has already published their third-quarter national accounts data) or the last two quarters of 2018 (if the second-quarter national accounts is only available) for the real GDP growth forecasts published in November 2017 to be true. I excluded Ireland because its national accounts data is chaotic at present and Slovakia because there was no data. So I took what national accounts data we actually have for 2018 so far and worked out what would have to happen in the remaining quarters (one or two) if the forecast was to be achieved. 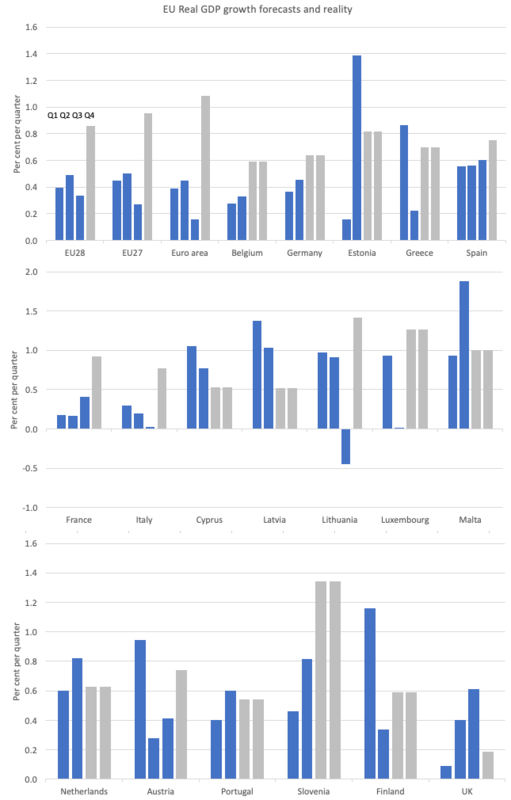 In the case of the Member States that have so far only published June-quarter data, I assumed the required growth would be equally distributed over the remaining two quarters. The following graph shows us what the situation would be and you will see how ridiculous (in almost all the Member States) were this time last year. The blue bars are the actual data already published at the time of writing by the various statistical agencies. The grey bars are what would have to happen to the actual real GDP if the forecasts were to be realised. So for the EU as a whole, the final quarter growth rate would have to be 0.86 per cent, when the average for the first three-quarters was only 0.41 per cent. It gets worse for the Eurozone. Its average growth rate in the first three-quarters was just 0.33 per cent. To meet the overly optimistic forecast, it would have to grow by 1.08 per cent in the final-quarter. That isn’t going to happen. For Italy, its average growth rate in the first three-quarters was just 0.17 per cent. To meet the overly optimistic forecast, it would have to grow by 0.77 per cent in the final-quarter. Interestingly, in the British case, growth is well ahead of expectation for the first three-quarters and it will easily meet its overly pessimistic growth forecast. Put the two sides together – overly optimistic in most cases and overly pessimistic in the British case, as the EU was trying to fuel the Brexit uncertainty – and you would have to agree that the latest forecasts for 2019 are to be disregarded. When I was young among my favourite songs was – That’s how strong my love is – which was written by Roosevelt Jamison and first recorded in 1964 by O.V. Wright (his version). The song made Jamison famous mostly because Otis Redding covered it in 1965. It was also on the Rolling Stones album Out of our Heads in 1965. That album remains one of my favourites. Here is Taj Mahal’s version. I first saw Taj Mahal in the early 1970s when I was first at university. This version is from his 1993 album – Dancing the Blues.